Did you know that you can now go on a helicopter tour in Kuala Lumpur? Started in the 3rd quarter of 2016 by Cempaka Helicopters in collaboration with Kuala Lumpur City Hall and Kuala Lumpur Tourism Bureau, Ascend Sky Tours offers locals and visitors alike the opportunity to see the city like never before – from high up in the sky, around 1,500 feet up to be more exact. 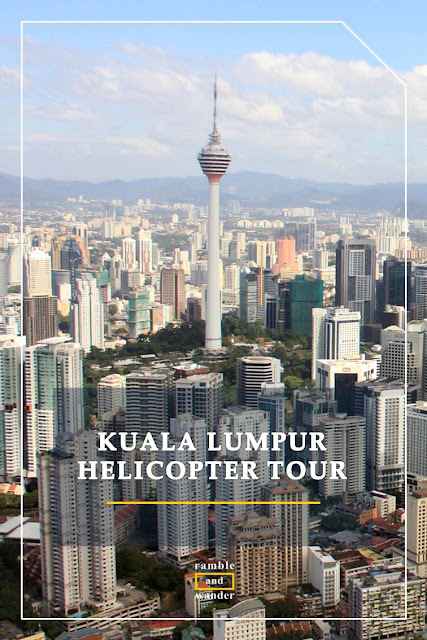 Using the centrally located Lake Titiwangsa Helipad, Ascend Sky Tours offer a unique chance for everyone to experience a helicopter ride and, at the same time, a bird’s eye view of Kuala Lumpur skyline at quite affordable rates. Since its introduction, I have had the opportunity to take two different tours with Ascend Sky Tours. The first time was when I joined the crew of KLIATV who were doing a documentary on the tour for Kuala Lumpur International Airport. The pilot, James Iskandar Jaafar-Greaves, who is also the owner of Ascend Sky Tours, brought us on a 30-minute tour that is offered as “The Jungle Escape” by the company. It was my first helicopter ride, so I was initially a bit apprehensive about it. What more when – as many of you probably have known from reading my previous blog posts – I’m actually afraid of heights. I mean, what should I do if suddenly fear strikes me? I don’t think shutting my eyes for the whole duration of the flight would help much, haha! There were 4 of us (excluding the pilot) and we were flying on the Robinson R-66. I went to sit in the middle back seat - not exactly comfortable for a 6-footer – because, you know, I thought that’s the “safest” seat for someone who’s afraid of heights. As I tried to make myself comfortable in the leather seat, our pilot gave a short briefing on how to use the headset for communication as well as on how to lock/open the door in the event of an emergency. And then we were ready for take-off. As it turned out, I regretted my choice of seat as soon as we took off. There was no fear of heights and my confidence grew by the minute. By then, however, it was already too late to ask for a seat change. From Lake Titiwangsa in Kuala Lumpur, we flew across the city towards Klang Gates Quartz Ridge, the longest quartz dyke in the world. I’ve only heard of this place before but never have had the opportunity to see it for myself. Seeing it from high above was amazing. Seeing it closer when our pilot manoeuvred the helicopter low along the river towards Klang Gates dam was even more exhilarating. Next, we headed towards Gombak for the limestone hills that are Batu Caves. As we had a video crew onboard, James told us to look out for a sinkhole on top of the hill, through which we could see the temple inside the cave, a site that is filled with hundreds of thousands Hindu devotees every year during Thaipusam festival. We managed to see the hole but not before he made a sharp turn that was quite nerve-wracking (for me) and electrifying at the same time. From there, we flew back towards the city centre, taking in beautiful major landmarks of Kuala Lumpur like the new Istana Negara (National Palace), the Ottoman-inspired Masjid Wilayah Persekutuan (Federal Territory Mosque), Masjid Negara (National Mosque), and Dataran Merdeka, including its architecturally beautiful and historic surrounding like Sultan Abdul Samad Building and Masjid Jamek (Jamek Mosque). Some might say that the route for Jungle Escape tour saves the best for last as we flew over KLCC (Kuala Lumpur City Centre area) and the Golden Triangle – covering KL Tower, Bukit Bintang, Petronas Twin Towers and its surrounding areas which are filled with a green park and many new skyscrapers. Those who say this are probably right. It’s the best time and spot to take a picturesque photo of Kuala Lumpur from above that could be your best & lasting memory of the city. My second helicopter ride over Kuala Lumpur happened a few months after when I accompanied a fellow travel blogger, Edgar, to experience the KL Express Tour, a 6-minute ride that covers main attractions of downtown Kuala Lumpur including KL Tower, Dataran Merdeka, Stadium Merdeka, and Petronas Twin Towers/KLCC. We were picked up by the company from our pickup point and brought to Lake Titiwangsa for our registration and flight. The pickup and drop off service is free for all packages other than KL Sky Express Tour. This time around, we flew on a four-seater Robinson R-44 and I sat on the left side at the back. Having previously flown with them, there was no apprehension about flying this time. In fact, I was excited to be sitting by the window, enjoying the bird’s eye view of Kuala Lumpur city centre. The route that we took seemed similar to the last part of my flight on the Jungle Escape Tour before. 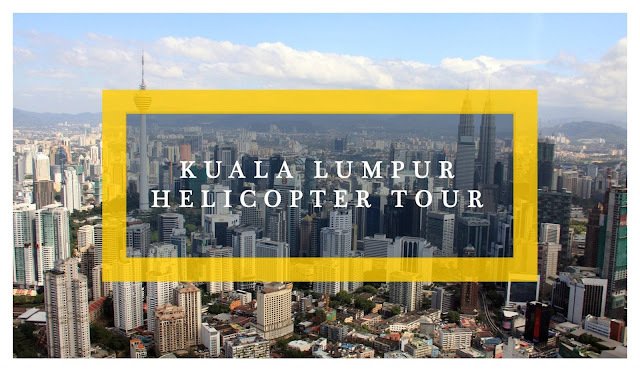 At 6 minutes, KL Sky Express Tour was a short but sweet ride, a great and relatively cheap option to experience flying in a helicopter and at the same time, see beautiful Kuala Lumpur from above. 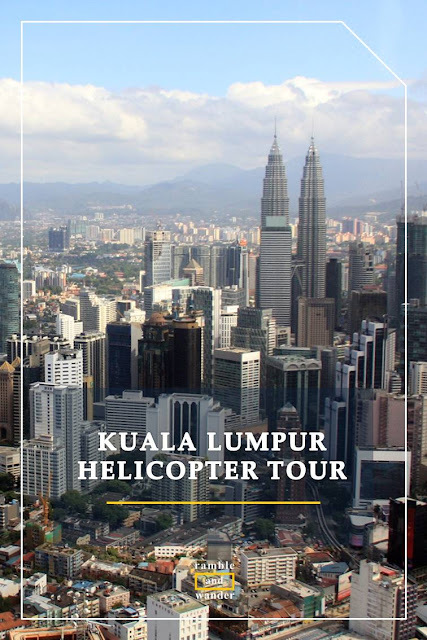 I would certainly recommend the KL Express Tour (MYR630 per ride for up to 3 persons, thus the cost could be as low as MYR210pp) just to experience flying in a helicopter for the first time and to see Kuala Lumpur city centre from above. A 6-minute ride may sound short – you’re forgiven if you wonder if it’s worth it at all – but combine that with a special occasion, the memory that you’d get from the ride would probably last forever. In short, I’d say that this is one of the must-do activities whether for first-timers or seasoned visitors to the city. And yes, for the locals too, of course! If you have extra budget, go for at least the City Explorer Tour (MYR1,550 per ride for up to 3 persons), a 15-minute flight that covers Batu Caves as well as Kuala Lumpur city centre. The Jungle Escape Tour (MYR3,050 per ride for up to 3 persons) on the other hand, is something that I’d recommend if you really want to splash for a longer ride. They also have a longer tour - The Mountain View Tour (MYR4,410 per ride for up to 3 persons) – which would bring you all the way to the valleys and mountains around Genting Highlands on top of everything else in about 45 minutes. If you can choose between a morning flight and an afternoon flight, go for the morning flight for a smoother ride. This is based on the recommendation of the pilot from my first ride, James Iskandar Jaafar-Greaves. The company will assign a seat for you based on the weight of every passenger but where possible, opt for the front seat or left one for a better view of the city centre. Most of the time, you’d probably be flying in the four-seater Robinson R-44, which has a maximum weight limit of 240kg for up to three passengers. So do bear in mind about the total weight limit for the whole group to avoid possible disappointment when planning to fly. Walk-in customers are welcome but if you have an occasion to celebrate, it’s better to contact them well ahead for any special arrangement. Have you guys tried any of these helicopter tours before? What do you guys think about it? Would you recommend it to others as well? Have you also tried any other city helicopter tours before? Going to Kuala Lumpur? Do check out these hotels for your accommodation requirements there. This is really cool! I've never been in such a tour but would definitely like to do one. The views you get when flying over a city are simply amazing. I'll check this out when I visit Kuala Lumpur! I'm quite a timid traveler in many ways, so my initial reaction to a helicopter tour is, "No Way!" But then listening to your descriptions, it actually sounds relatively safe and like an amazing experience. Maybe I should start with one of the shorter tours to be safe and then work up to something like the Jungle Tour. It does sound like you had fantastic experiences, and it's a unique way to see Kuala Lumpur, for sure! I've never been in a helicopter, but I'd love to! Kuala Lumpur sounds like a perfect destination to tour in a chopper, to be honest. I imagine it made for lovely views and quite the adrenaline rush! Ooh! I never would've thought of doing a helicopter ride over KL, but it sounds and looks phenomenal. I love helicopter tours! I love it that you've had multiple helicopter rides over the city! :) I've yet to get into a helicopter. I think it'd be a great way to see a big city like Kuala Lumpur. Definitely adding it to my list. Wow! I've been to KL and truly amazed on this city. What more if I could do a helicopter tour? That would be totally awesome!!! Would love to experience it since I never had a chance to ride a helicopter.